The Bristlecone Loop is reachable at southern end of the park from Rainbow point, meanders the highest point of the park, and connects through the forest at an elevation of over 9,100 feet. The trial circles on the top of the upland above the adjacent canyons. You can notice a beautiful landscape all through the trial and it takes you to bristlecone pines which are considered some of the oldest plants alive, dating back 1,800 years; this is the only park where you can find the beautiful bristlecone pine trees. Hiking in Bryce Canyon is without a doubt one of the best things you can do here. And if you’re looking for a neutral place to stay in-between Bryce Canyon and Zion Canyon, then take a look at Zion Ponderosa. They offer some of the best cabin style amenities it all of southern Utah, and are perfectly situated to give you easy access to both parks. The forest looks radiant with Blue Spruce, White Fir and Douglas-fir and a home for woodpeckers, grouse, owls, chipmunks and squirrels. You can also see Stiller’s Jays and Ravens in the forest. And it is home for a lot of species and animals. The trail will be closed during mid-winter season due to heavy snow. The trial will be covered with snow from 2 feet to 15 feet during this period. Rainbow Point Parking: Rainbow point is the starting point of the trail; you can find the parking lot at the end of the State route-63 to park your cars. From there you can reach the trail head for Yovimpa point, under the rim-trial, Rainbow point, and Riggs springs loop and finally Bristlecone Loop Trail. Rainbow Point: Rainbow point is located at around 9,100 feet above the canyon. The place is filled with awesome scenery of Deer Mountains, springs camping area, and Horse Mountain and other beautiful sites in Bryce Canyon. 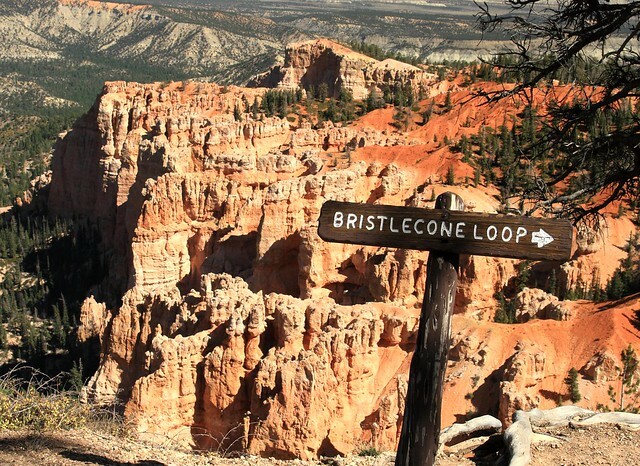 Bristlecone Loop: The trail offers the breathtaking view of the beautiful Canyon at the southern end through Riggs Spring Loop, Horse Hollows, Mutton, Corral and Yovimpa pass. Yovimpa Point: Take a good look at the Canyons below when you are walking on the trails at the Yovimpo point; you are sure experience the thrilling moments when you look down the canyons. It is located on the same plateau as Rainbow point. Under the Rim Trail: The parking lot is located where the Under the Rim Trail starts. The trial starts slantingly and falls on the upland, then it turns east and circles around the west before finally reaching the Agua Canyon located at the north passing. Conclusion: Bristlecone Loop starts at a dirt fire road slope for the first 3 mi. The loop turns to single-track at the intersection at the Bonanza Trail. You can park the car from the top for the Upper Bristlecone Trail and lower bristlecone trail on Lee Canyon Rd. It is also a famous place for hikers so stay vigilant for hikers.